Simon, we don’t need empirical confirmation that water runs downhill. The demand curve is downward slopping. I find it impossible to have any other view. Alternative views on the impact of the minimum wage do not rely on non-downward-sloping demand curves. I don’t know why people always reference this. You’ve summarized my undergraduate economics education: when theory clashes with evidence, stick with the theory. Lars, thanks for summarizing my undergraduate economics education: when theory clashes with empirical evidence, stick with the theory. You might want to read the full article from Krugman, Lars. And I think it would be very unfortunate to cut off discussion of the topic where you’ve apparently decided to cut it off. I suppose it depends on whether firms are enjoying supernormal profits and what type of market we’re in. Assuming perfect competition, raising the minimum wage is very destructive. But in the current economic environment, firms seem to be doing well enough, they just aren’t hiring. I imagine this has to do with the supply of labor growing faster than the capital stock – due to population growth, expanding trade frontiers, and what have you. If Democrats really cared about the minimum wage, they’d impose a strict moratorium on low-skill immigration (90% of immigration to the US) and enforce current US law and deport illegals. This would automatically restrict labor supply for low-skill workers and increase wages. The consumers would hardly notice for agricultural goods, whereas many services would become pricier. But it would improve the Federal and State budgets. Paideia, closing the US borders would be even worse economics than an increase in minimum wages. The US needs more and not less immigration. It should be testable: “supply of labor growing faster than the capital.” If that was the case, we’d expect people to react to the capital shortages — companies would be desperate to borrow money to invest and grow, you’d never see companies holding on to cash or buying back stocks. Japan, with large capital stocks and neither natural nor immigration increases in the supply of labor, on the other hand, should be thriving: huge capital per person. None of the various graphs from basic economics seems to explain our current economy: simultaneous high profits and surplus of capital, financial-capital being locked up away from becoming physical-capital while people are unemployed. Does this theory match evidence: between mergers and inter-locking corporate boards, capital is often and increasingly taking on monopolistic behaviors: companies are slamming down wages rather than growing, buying competitors rather than trying to more efficiently outproduce them, paying CEOs obscenely *despite evidence that the high pay is negatively correlated with company profits,* financial markets increasingly extract wealth rather than profit by finding efficient investments. These steps not only decrease equality, they mean that people are getting paid for nonproductive activities, plus the Keynesian problems of inequality. Yes, cutting off immigration would likely help some workers low on the pay scale — and also mean some additional jobs would go overseas. But that can’t be central to what’s going on in our economy at a macro level, too many countries with wildly different labor patterns are having similar macro. If we ever want a functioning market economy again, we need to look at the busting of the giant conglomerations at the turn of the last century, get sane-scale competition happening again. It’s really a bit insulting to your readers to quote the Econ 101 response and omit the next sentence, wherein he says the best studies to date have found negligible, or even positive effects. Go ahead and be as dogmatic as you like, but don’t pretend that Krugman was claiming the same position as you take. If N1 > N2 then by definition there is slack in the economy. 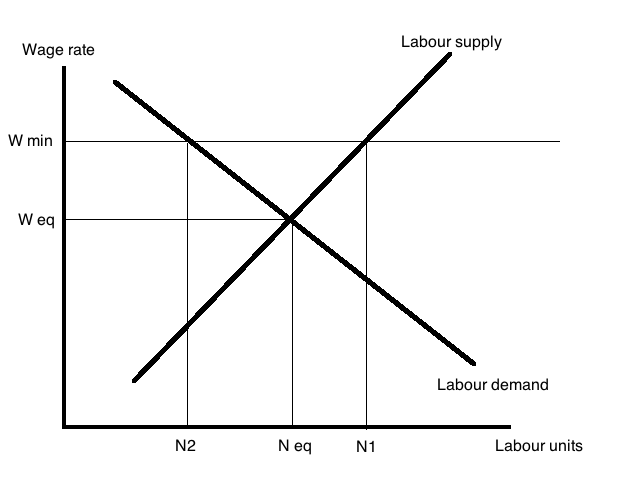 Why can’t the central bank by controlling the supply side drive N2 towards N1 even at the higher minimum wage? If the central bank refrains from moral judgments about the desirability of a minimum wage and simply targets NGDP then the economy will adjust with slightly higher capital substitution for labor and a slightly higher fraction to total NGDP going to labor. Labor will still be “fully employed” due to the macro environment. Leave the moral desirability of that decision to the elected representatives and just make sure macro policy is sound and workers will find the jobs even at a higher minimum wage. You are the voice that always reminds us we can’t ignore the monetary response in questions like these. Why draw supply/demand curves that do just that in this particular case? meant by controlling the “demand” side in the second paragraph. Sorry.